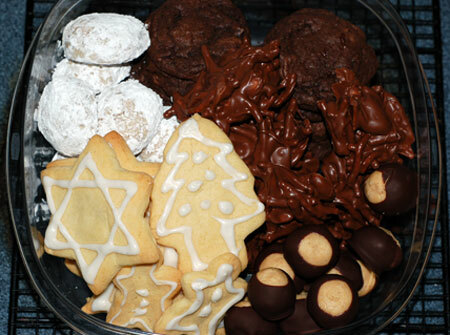 This week’s posts will be all about the Christmas cookies. I haven’t heard any bad news from the doctor’s office about my glucose test last Wednesday, so I’ve forged ahead with the holiday baking. Yesterday was dedicated to baking piles of cookies for Jeremy and I to share with our co-workers before vacation starts. I was decision-challenged this year when it came time to choose recipes. Jeremy’s only request was a pan of oatmeal carmelitas that we don’t have to share, so that’s at the top of the list when the current stock runs low. In the meantime, I ended up going back to some old favorites that many people will be familiar with, including more chocolatey goodness than I had intended. 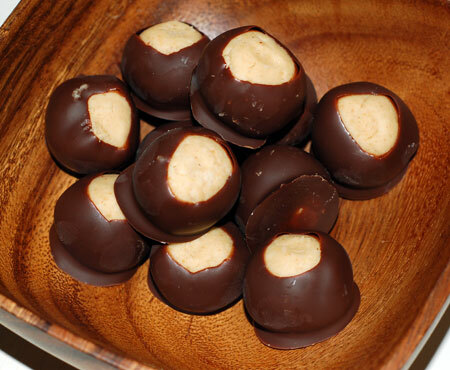 Today I’m sharing a recipe for buckeyes, a chocolate-dipped ball of peanut-buttery heaven. It seems only natural that they should be one of my favorites since both of my parents are from Ohio. Strangely, though, I’ve never tried my hand at making them until now. They are very easy to do if you make sure the balls are well-chilled before attempting to dip them in the melted chocolate. I ordered a 2-teaspoon cookie scoop for them, but it was backordered until January, so when it comes, I’ll just have to use it for truffles or something instead… poor us! In a medium bowl, use your hands to knead together peanut butter, butter, vanilla, and confectioners’ sugar until it forms a stiff, uniform dough. Since the amount of sugar needed may vary a bit based on warmth and humidity, you may want to add the first cup at once, and then a quarter or half cup at a time until it reaches a good consistency: firm, rollable, and neither crumbly nor sticky. Shape the dough into balls using about 2 teaspoons of dough for each ball. As I mentioned, a small cookie scoop would be very helpful here. Place on prepared pan, and refrigerate until firm. Melt shortening and chocolate together in a small saucepan over low heat, stirring constantly until smooth; remove from heat. Remove balls from refrigerator. Insert a wooden toothpick into a ball, and dip into melted chocolate, leaving a small circle of bare filling visible on top. (I found that angling my pan so the chocolate was all pooling on one side helped facilitate this. Work quickly so the balls stay chilled, as they fall off the toothpick into a lake of chocolate if they are too soft and warm.) Return to wax paper, chocolate side down, and remove toothpick. Repeat with remaining balls. If the toothpick holes bother you, it is the work of a moment to smudge the peanut butter smooth again. Refrigerate for at least 30 minutes to set the chocolate. Try not to eat them all at once. I keep seeing these on blogs, but I’ve never made them before. They look so yummy! Deborah, they’re very sweet, but if you’re a peanut-butter cup fiend like me, you’ll love them. 🙂 I think they would hold up with lots of variations too, mixed into the peanut butter or dipped in after the chocolate, though you’d lose the classic “buckeye” appearance.